Our shrink bundling system uses PLC-controlled shrink tunnel to adjust parameters for excellent bull’s eye placement at varying in feed rates. Convect air™ shrink tunnel operates at lower temperatures for highest energy efficiency. Technically advanced model sb-2030 of sb – series shrink bundlers offers the most consistent shrink bundling performance during operation. Our shrink bundling system is efficient for wrapping up to 30 transport packs per minute with low energy consumption and consistent bull's-eye placement. 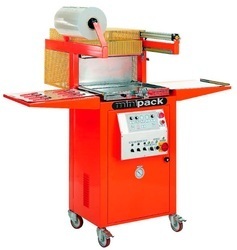 The bundler is ideal for product shipped on corrugated trays, pads, u-boards or with film only such as canned goods, beverages, ice cream, household chemicals and cleaners. 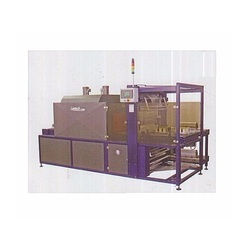 Durapak Skin Packaging Machines are efficient to work with any skin packaging film and board. Loaded with features, these stationary oven machines take about half the floor space of our competition's moving ovens. It has no moving parts to wear out and you get precise control in a stationary oven which eliminates the dangers and mechanical failures associated with moving vents or those with heating block devices. Each model of skin packaging machine is specifically designed to handle standard master board sizes of 18x24, 24x30, 24x36, and 30x36 inches.